Meet the most flavorful stout ice cream out there. I mean it. 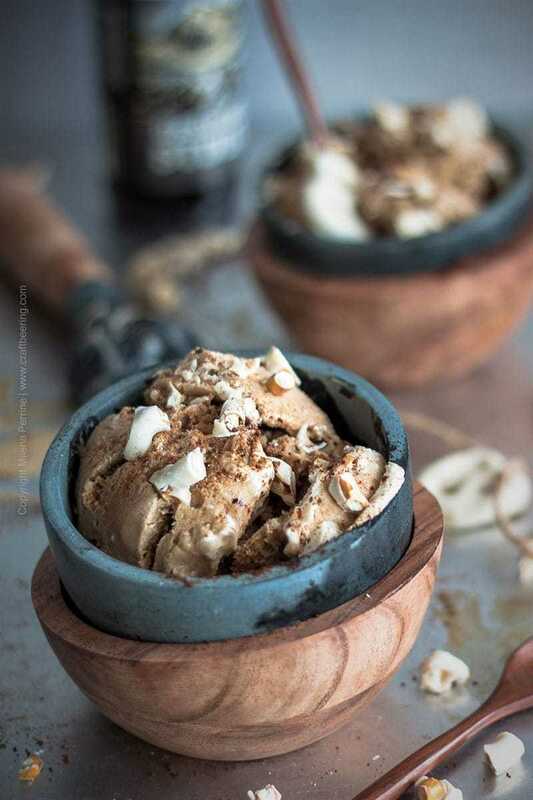 I make it with twice the stout typically used in similar recipes which delivers a potency of flavor that is guaranteed to cause you to forget any other stout ice cream you may have had. Speaking of flavor, it is all about choosing the best stout possible. Whatever that means to you individually, but I do have suggestions for you to consider. 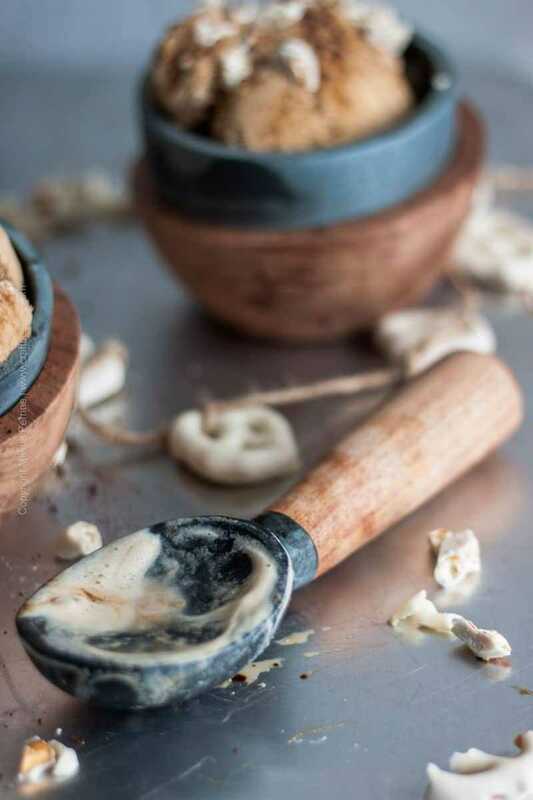 Remember when I shared how a few years ago I was obsessed with making stout ice cream? I experimented with several styles and various recipes. As that summer progressed one specific stout became my absolutely favorite to use in the recipe. Obsidian Stout brewed by Deschutes Brewery in Bend, OR, the same one Chris and I used to mix our delicious Game of Thrones Dragonglass cocktail with bruleed pears. Obsidian Stout has the perfect balance of dark chocolate, espresso and silky roastiness. If you can find it where you live, do use it in this recipe. It will impress you. Generally – well balanced stouts in terms of the malts and hops interaction as opposed to dry, hoppy Irish stouts or boozy imperial stouts. Let’s talk toppings. Obviously, go with whatever speaks to you, but if I may suggest – try crushed yogurt dipped pretzels and a sprinkle of freeze dried coffee (aka instant coffee). An ice cream that has the flavors of Obsidian Stout as its backbone welcomes the sweet and salty crunch of the pretzels and the distinct zing delivered by the coffee. I simply cannot praise this topping combo enough. Because my ice cream recipe calls for so much of the ale, it is quite soft. Yes, you will ‘cook’ a lot of the alcohol out from the beer in the process of reducing it to make an improvised simple syrup with brown sugar, but some alcohol does remain. And alcohol does not freeze easily. So be sure to keep the ice cream in the freezer for at least twenty-four hours after you transfer it from the freezer bowl of your ice cream machine. In order to keep it from melting for the longest time possible do serve it in chilled bowls. Not that it will take you that long to eat it, not at all, but something that tastes this good should be presented and enjoyed in its best state possible. 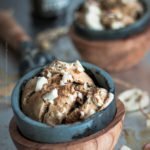 The best stout ice cream - rich, velvety and potent toasty, dark chocolate and coffee flavors, creamy and soft. 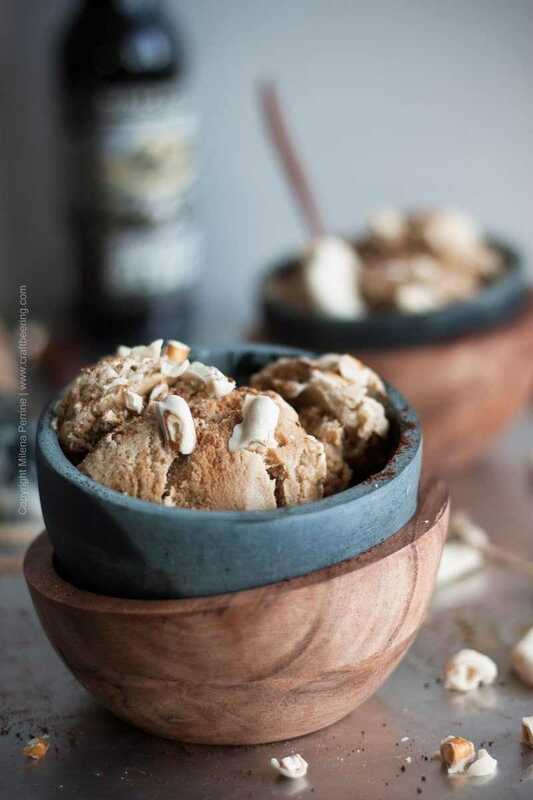 With twice the stout of typical recipes and plenty of brown sugar and cream:) Requires an ice cream making machine. Before you begin make sure that the freezer bowl of your ice cream machine has been appropriately frozen. Start by gently pouring the two stouts and the brown sugar into a large sauce pan. Bring to simmer (just over medium heat and just under medium high heat) and stay nearby to make sure that the stout does not begin to foam and boil over (it can happen if the heat is too high). Let simmer, stirring occasionally until the mixture is reduced by half (to just over 12 oz). On average this step takes about 15 minutes. Remove the (now) stout syrup from the heat and let cool off and then chill in the fridge. Once chilled, you can begin to make the custard for the ice cream. In a mixing bowl whisk the egg yolks, the milk and the cream. Add the chilled stout syrup, the vanilla and the pinch of salt. Mix well and transfer to the freezer bowl of your ice cream machine. Churn according to the instructions of your ice cream machine maker. Once the ice cream has reached thick and creamy consistency, transfer to an airtight container and freeze for at least 24 hours before serving. Serve in chilled bowls for maximum enjoyment. Hi Kiko and thanks for stopping by! That milk stout sounds dreamy! When I looked it up the ABV is listed as 13.5%. The higher alcohol will lead to a softer serve ice cream than what you’d get following the original recipe, but it should work. Use only 12 oz, maybe even 10 oz, in lieu of the reduced stout. Do warm up the stout on the stove just enough so that you can get the brown sugar to dissolve, then chill before adding to the other ingredients. Would love to hear how it turned out! Made this for Father’s Day, using Rogue Chocolate Stout since my store had run out of Obsidian (P.S. thanks for explaining what flavor profiles to aim for; super helpful). I’ve never enjoyed dark beer -that’s my husband’s thing- but even I thought this was a.ma.zing. Definitely saving this recipe to use again on company. Thank you guys!! Thank you so much for taking the time to share Debra! Using the Rogue Chocolate Stout sounds like a great choice. Never had a bad beer from Rogue! Thanks for this recipe! It was super delicious, the only change was using dark chocolate pretzels instead of yogurt ones. Definitely will be a repeated. Thank you, Heather for trying it out! Happy to hear you liked it. Dark chocolate covered pretzels sound so good right now, mmm. Wow, Milena, what flavors you have here! 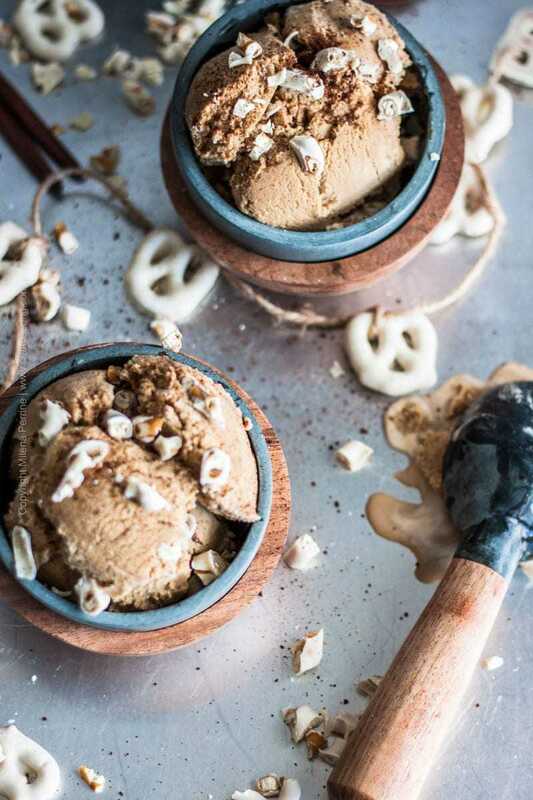 I don’t think I’ve ever tried stout ice cream…I know, shame on me 😉 , Your double stout ice cream sounds wonderful, and the yogurt pretzels must be delicious crushed in there. Those bowls look really nice and perfect for either hot and ice food, and the ice cream scoop is so nice! 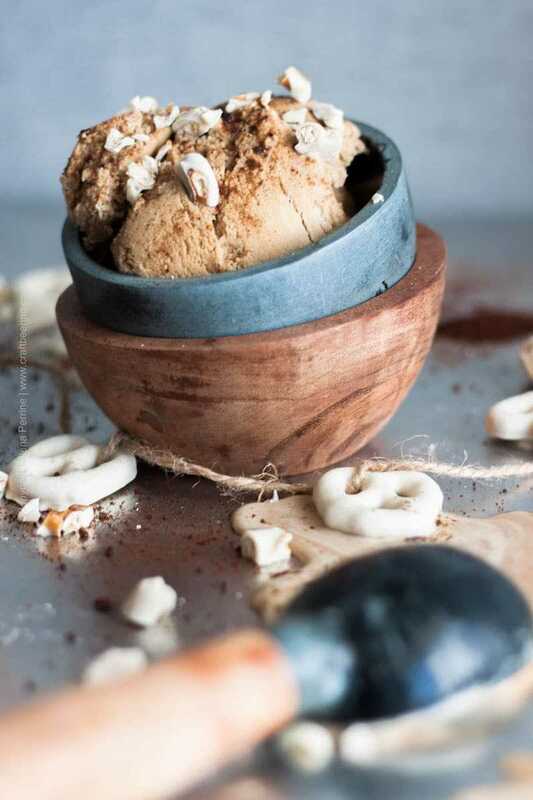 Ok first… those bowls are beautiful and that ice cream looks amazing. The ice cream looks amazing but I am OBSESSED with these bowls!!! this is a brilliant idea! love the flavour combo, and those bowls look so so SO cool!!!! Hmmm – I see a chocolate stout in my future! Thanks for sharing at the What’s for Dinner party! This ice cream looks amazing! I have some cream in the fridge that I want to use up, and this looks like a really good solution! I say YES to all of it! The ice cream, the bowls, the pretzels, the freeze-dried coffee! Such a flavorful experience you have going on here! I love, love, love it!! Thank you so very much, Annie! The bowls and scoop really do justice to the ice cream:) Thank you, Jennifer! Those bowl are pretty gorgeous and this ice cream? Yes please! My fave ice cream is mint chocolate chip and this time of year I always have candy cane floating around our freezer. I will definitely have to give this one a try cos this girl loves her some stout. Those yogurt pretzels and freeze dried coffee on top sound like the perfect addition. I can only imagine the lovely punch-in-your-taste-buds flavour of the salty sweet pretzels with the stout ice cream. YUM!!! Dangerously good, my friend 😉 Pinned!